Before I talk about this product, I should probably give you some background on my particular skin. Years ago, I had what I considered to be clear and nice looking skin until suddenly I developed acne and it just took over. It felt like the problem came out of nowhere and wouldn’t leave for the longest time. In the end, my struggle with acne lasted for about 10 years until I finally overcame it (more on that in a later post). Having acne all through the years, sadly, blinded me to other problems that were developing – pigmentation, pitted scars, and visible signs of aging! Suddenly, I had an entirely new battle on my hands that was just as bad as acne if not worst. After doing a great deal of research, I learned was to incorporate a Vitamin C serum to my skin care regimen. What are the benefits of Vitamin C Serums? That sounded like everything I needed in one bottle! So I set on my journey to try it out for myself and in the process, I experimented with several Vitamin C serums. Unfortunately, the majority of them were unimpressive, to say the least. Finally, I stumbled across this little bottle of magic and I can’t tell you how pleased I was by the results. I’ll keep it short and sweet by listing the pros and cons so you know exactly what to expect. Philosophy Turbo Booster Vitamin C Powder isn’t the lowest costing Vitamin C product on the market nor is it the most expensive, but it is one of the most effective and that’s what matters. 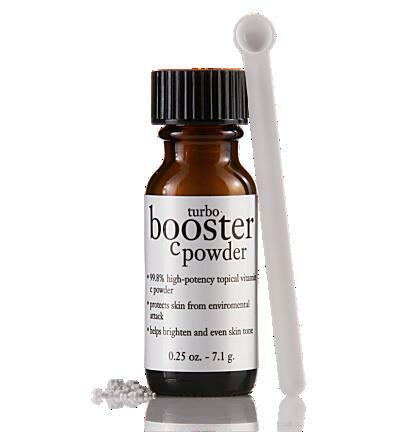 If you’re looking for a Vitamin C serum that actually delivers, Philosophy Turbo Booster Vitamin C Powder then is for you.